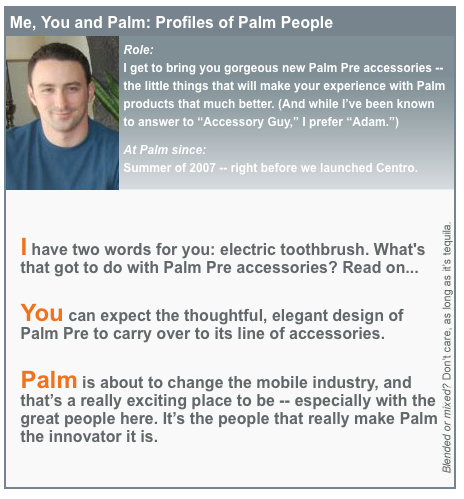 Palm has posted up another of their Pre Profiles -- this time it's of Adam Kaufman, Product Manager at Palm in charge of Accessories. In other words, he's the man responsible for bringing Touchstone to us. The inspiration for the wireless-charging-via-magnetic-induction wonder? The lowly electric toothbrush, which uses the same method. As with the last profile, Kaufman will be answering questions on Palm's Facebook board. It's something to keep an eye on, as last time we got a pretty full answer on the whole "expansion card" debate. Palm recommends asking him about Tequila, the universal accessory. We recommend you don't partake of that particular accessory before you submit your question. Friends don't let friends anticipate the run-up to the Pre drunk.